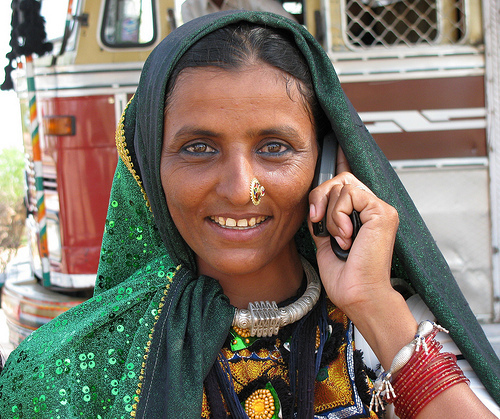 The Indian telecom industry is the world’s fastest growing industry with 792 million mobile phone subscribers as of February 2011. It is also the second largest telecommunication network in the world in terms of number of wireless connections after China. The industry will reach around $80 billion in revenues by next year showing an astounding CAGR of over 25% and will employ a stupendous 1 crore employees making it one of the biggest value creators in India in recent times. The introduction of mobile phones brought a major revolution in the industry. Mobile phones have become a modern day necessity. Be it a professional, a trader, a housewife or a student, everyone has one. The availability of cheap mobiles in the Indian market, is also a major factor in making it available & affordable to the common masses. Today’s mobile phone is not just a phone, it has a built in camera, music system, games & internet enabled networking. These facilities entertain you as well as make you available to work as & when required. 1) Nokia – Nokia has played a pioneering role in the growth of cellular technology in India. Nokia started its India operations in 1995, and presently operates out of offices in New Delhi, Mumbai, Kolkata,Jaipur,Lucknow,Chennai, Bangalore, Pune and Ahmedabad. Today, India holds the distinction of being the second largest market for the company globally.Nokia has established itself as the market and brand leader in the mobile devices market in India. The company has built a diverse product portfolio to meet the needs of different consumer segments.products that cater to first time subscribers to advanced business devices and high performance multimedia devices for imaging, music and gaming.Nokia has one of the largest distribution network with presence across 1,30,000 outlets.With the global launch of Ovi, the company’s Internet services brand name, Nokia is renewing itself to be at the forefront of the convergence of internet and mobility. 2) Sony Ericsson – is a joint venture between Sony & Ericsson. The Sony Group is primarily focused on the Electronics, Game (PlayStation), Entertainment (such as motion pictures and music), and Financial Services sectors. Ericsson provides mobile and fixed networks, multimedia solutions and telecom services which make a real difference to people’s lives. Sony Ericsson phones are known for their stunning hardware and performance. Their Xperia phones have Android features, which gives access to the best applications and services around. It enables launching apps in an instant, viewing messages, mails and more. Sony phones are known for their good camera & sound system. Not only this the camera is excellent & provides great stills & videos. 3) LG – LG brand is one of the most well-known in the world for different electronic products. LG mobiles offer range of CDMA handsets, GSM handsets, 3G handsets, and cellular phones. LG mobiles are economical and affordable which makes it most approachable brand in the market for people from every class. LG mobile has different models like Viewty, Shine, Dynamite, Pulse and Bullet. These high range mobiles have advanced features and attractive enhancements. Shoot, play music, browse internet, connect with system, store data and many more. 4) Samsung – is a leading name in TVs, air conditioners & electrical appliances. Samsung mobile phones come in a range of dual sim, Qwerty, CDMA, smart, touch, multimedia phones & tablets. From the coolest conventional and brightest smart phones, to the most stylish touchscreens, bars, sliders and feature-rich devices with full QWERTY keyboards, Samsung has everything to offer. 5) Research in Motion (RIMM) – Blackberry introduced by the Canadian company Research In Motion (RIM) in 1999, it delivers information over the wireless data networks of mobile phone service companies. It supports push e-mail, mobile telephone, text messaging, internet faxing, web browsing and other wireless information services. It was the first phone which laid emphasis on e-mail service onmobile phones. RIM announced 8 million BlackBerry subscribers in 2007. Most BlackBerry devices come with a QWERTY keyboard. Generally providers offer flat monthly pricing for unlimited data between BlackBerry units. In today’s busy life, credit can be given to Blackberry, which has enabled socializing a lot, be it setting up movie dates with friends or with business associates to attend meetings. It comes in a wide range of GSM, CDMA & GPRS enabled phones with features like camera, speakerphone, Bluetooth, MicroSD, polyphonic ringtones, media player, Wi-Fi etc. Motorola creates numerous products for use by the government, public safety officials, business installments, and the general public. These products include cell phones, laptops, computer processors, and radio communication devices. 6) Apple – Apple the biggest company in the world by value which has changed the entire technology sector more than any company in history though launch of iconic products like iPhone,iPod and iPad does not have a strong presence in India.This is due to Apple’s premium pricing which means that the vast number of Indians simply can’t afford Apple products.However in recent times Apple has been reducing its prices of older products.Most of Apple’s smartphones in India are brought from outside rather than being sold here. 8) Motorola-Google -This American-based, multinational, telecommunications company, Motorola’s wireless telephone handset division was a pioneer in cellular phones. It pioneered the flip phone with the StarTAC in the mid-1990s, and had a rebirth with the RAZR in the mid-2000s before losing significant market share. Lately it has focused on smartphones using Google’s open-source Android mobile operating system. The first phone to use the newest version of Android 2.0, was released in 2009 as the Motorola Droid. The handset division has since then been spun off into the independent Motorola Mobility.With Google buying Motorola now,expect the best Android phones to come out of this company. 9) Spice – Now a subsidiary of Idea Cellular Ltd.which owns more than 80% equity in the company. The Aditya Birla Group took over the ownership of Spice Telecom for over Rs 2,700 crore. The prepaid users(which form majority in India) had problems getting their phones recharged with prepaid balance when in roaming. Hence, Spice could not regain the market share inspite of its low tariffs. Spice provides dual sim, GSM, CDMA, internet enabled phones. It allows cell phone users to publish, convert, and share all kinds of user generated content. 10) Karbonn – The company is presented by two Indian telecom majors – UTL and Jaina.The UTL Group is a multi division telecom group with an annual turnover of Rs 1600 crore. It is a leading Indian telecom powerhouse with interests that span across manufacturing, services and distribution.The Jaina Group is a reputed distribution house with interests in telecom and consumer durables. The company has represented, prominent brands such as Nokia, Samsung, Siemens, Panasonic and Philips (LCD devices) as regional or national distribution partners & are currently the national distribution partners of HTC and Motorola. The mobile phones come in the range of CDMA, touch screen, dual sim with features like long battery life & FM Radio,quality, technology, service and more, it is the perfect harmony of style and function. 11) Micromax – Since their entry into the Indian mobile handset market in March 2008, the overall market share increased from 0.59% for the quarter ended September 30, 2008 to 6.24% for the quarter ended March 31, 2010. The handset sales have grown by 123.48% from 1.15 million units in the quarter ended June 30, 2009 to 2.57 million units in the quarter ended March 31, 2010. It also offers CDMA, touch phones, besides the normal range of phones. Its marathon battery phone gives an extended battery life to the phone. It also has Qwerty features in its Bling phone.